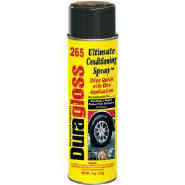 Get that "wet look" tires so deserve with Ultimate Detail Spray. Dries quick, and with just one application, leaves tires (black or whitewall) looking better than new, thanks to a blend of synthetic siloxanes. Works great on bumpers, moldings, door jams and AC vents as well.